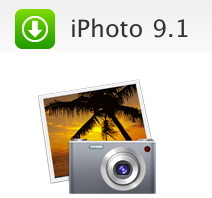 Apple has released a new update for iPhoto ’11 (part of iLife ’11) on the Mac. The update adds more print products as well as fixes. This update adds several new print product options to iPhoto ’11. It also improves overall stability and addresses a number of other minor issues. For more information and to download it: iPhoto 9.1.
iLife ’11 was released a few weeks ago during Apple’s Back to the Mac event. It is sold for $49 and available for free with all new Macs.